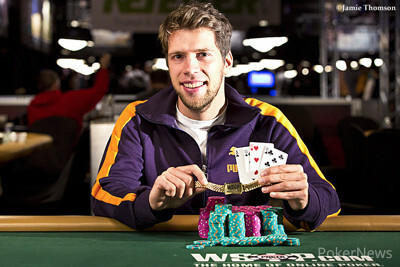 Florian Langmann topped a field of 474 entrants to take down Event #54: $3,000 Pot-Limit Omaha Hi-Low for $297,650. 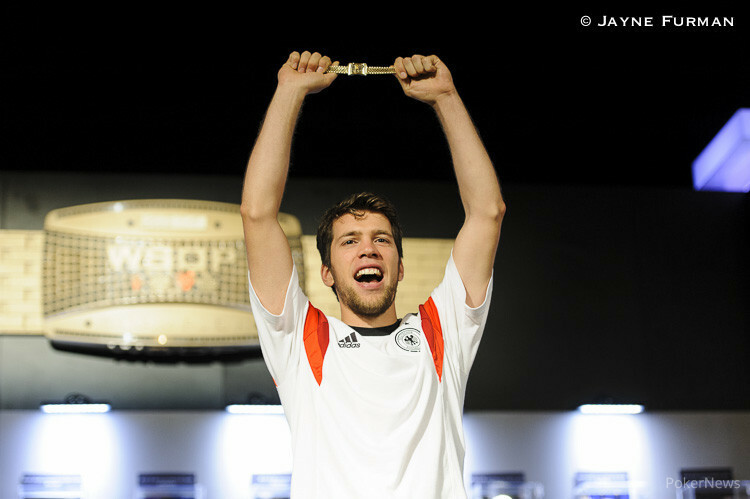 The German had already amassed more than $2 million in live tournament cashes, but this is his first bracelet victory. Twenty players advanced to Day 3, and Langmann scored plenty of knockouts on the way to his victory. His game plan was clear. "I guess I'm going to be the guy that's least afraid to gamble and that's worked out so far for me," he told a PokerNews reporter just before the official final table commenced. "You can't be too aggressive in this game." Langmann backed up his words, finding himself in plenty of all-in situations, sometimes with less-than-stellar preflop holdings. In one of the most key hands of the final table, he knocked out dangerous Omaha Eight-or-Better player Woody Deck in seventh when he attempted to isolate a short stack and got caught by Deck, eventually making two pair with . 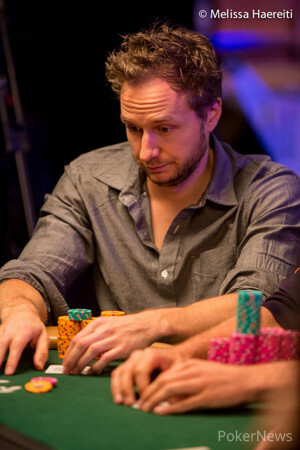 After accomplished Frenchman Antony Lellouche was eliminated in sixth, TJ Eisenman busted in fifth, and Doug Baughman bowed out in fourth, three-handed play began with Langmann and eventual runner-up Zach Freeman virtually even in chips. Langmann's aggression again paid off with good fortune, as he busted Dylan Wilkerson on a board with against , dodging seemingly infinite outs when a hit. At that point, the six-to-one chip deficit was simply too big a hole for Freeman to climb out of heads up. Thanks for following along with another great World Series of Poker event right here on PokerNews. Zach Freeman got it all in against Florian Langmann after a flop of . Freeman's threes were ahead for high, while Langmann would take the low if a low card hit. The dealer burned and turned: . "How did you do that?" Langmann asked. "Eight." 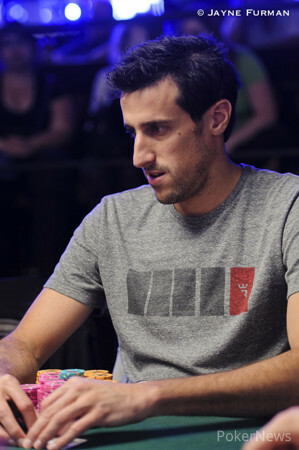 The dealer burned and turned once more: , giving Langmann the tournament with a pair of eights. Zach Freeman raised the button, and Florian Langmann put him all in. Freeman called. "Aw, you have a good hand, too," Langmann said. "You already have a pair." "Want to trade?" Freeman asked. "Still want to trade?" Langmann said. "You will see, a nine is coming." Langmann was right: that was the river, but unfortunately for him it came after an turn, so Freeman snagged the pot with a straight. Zach Freeman just got it in on the turn with against Florian Langmann's on a board. He hit a set of queens on the river to double up. On fourth street, the board read , and the two biggest stacks, Dylan Wilkerson and Florian Langmann, clashed all in. Langmann had kings up with a flush draw, but the draw was trumped by Wilkerson, who had seemingly countless outs with the nut low draw, nut flush draw, and a double-gutshot straight draw. The dealer peeled off the last card: the one of the few cards that didn't give Wilkerson any of the pot. 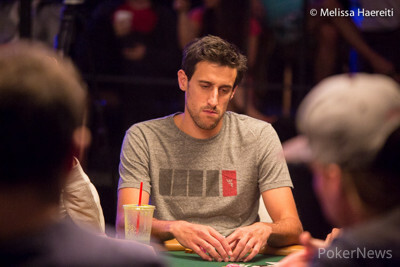 Langmann had a covering stack, and heads-up play begins with him holding a massive lead. Zach Freeman looks focused here, but he doesn't always remember his blind. "Fifty," the dealer said, pointing at the empty space where Zach Freeman's big blind was supposed to reside. "I'm the worst, I know," Freeman said with a laugh. It wasn't the first time Freeman had been absentmindedly shuffling chips when he was supposed to have a blind out. "You should see me in..."
"Stud?" the dealer said, finishing Freeman's sentence. "Oh God." Florian Langmann made it 90,000 in one of the last hands at the previous level, and Dylan Wilkerson defended his big blind. Both players checked on the flop, and Wilkerson bet 150,000 on the turn. Langmann called to see the hit the board. Wilkerson checked, and Langmann bet 300,000. "Set," Wilkerson responded, spreading for a set of fours. "Whaaaat," a surprised Langmann said before mucking. Florian Langmann raised to 90,000 on the button and got three-bet to 290,000 by Dylan Wilkerson in the big blind. Langmann called, and Wilkerson must have hated the flop, as he check-folded to 150,000 on .